So, word on the street is that when you're pregnant, you can eat anything you want. I'm so game. This is just what I've heard. I've never been pregnant. Surprise! But though I've never been pregnant, last week, I imagine, I had pregnant woman hunger. Every day. That growling empty pit-like feeling never left. Maybe a better analogy is a garbage disposal. Whatever. I stood somewhere between a pregnant woman and a garbage disposal, and I couldn't be stopped. I know perfectly well why I was hungry. It was the last week before my half marathon, and between the high mileage and long days I was left ravenous at all points. 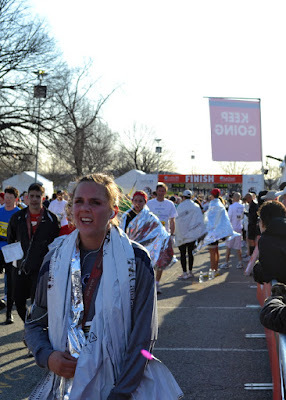 And my race was yesterday, which means today was for replenishing... in a major way. I usually never eat cream sauces. They just aren't my bag. But today, because I was feeling adventurous and well deserving, I whipped up a fantastic pasta dish that I will definitely keep on hand. 1. Prepare linguine as directed on box. 2. Melt 1 tbsp of butter in a medium skillet. Add garlic and onion and cook until onion is tender. Add wine and turn heat up to high until liquid reduces by half. Add salt and pepper to taste. 3. Meanwhile in another skillet, melt butter and add flour. Cook until smooth, about 5 minutes. Add the milk slowly, just a few tbsp at a time. It will look like some sort of dough but keep adding milk and stirring and it will smooth out. 4. Once smooth, add onion mixture into flour mixture and stir. Add crab meat. 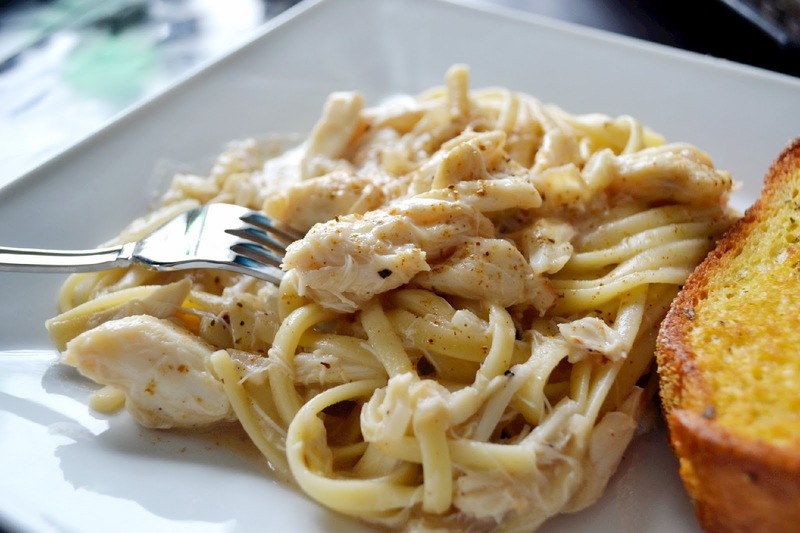 Serve over cooked pasta and top with old bay seasoning. omg that pasta looks good. 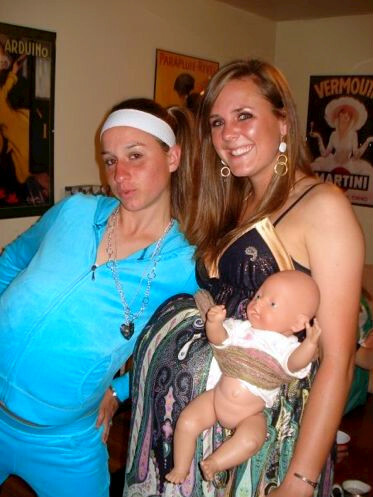 ahahha love the pregnant pic! Ok, so this induced a "holy crap" reaction. I LOVE the recipe. Love, love, love. It's bookmarked and I am going to splurge on the crab meat. Oh yes, I am! Congrats on the marathon and the not-pregnant thing. OMG! This looks seriously amazing! Congrats on the run! And I love that "pregnant" pic! Hilarious!